We’ve made four trips to Shangrao to date to see four of our kiddos: Leonard, Charissa, Wes, and Beth. Shangrao is some distance away but we feel that the seven-hour train rides are worth it because if we want lasting change—and that is our goal, of course—we must build a strong relationship. The focus of our first trip was primarily Leonard’s eye-gaze communication device and assessing training needs for the therapists at Shangrao. There are four “therapy” ayis at the orphanage; however, none of them had previously received any training. First and very importantly, we taught these ayis how to assess the developmental age of a child. Once you understand a child’s developmental age, then a therapist can work with him or her on the next developmental milestone. Additionally, we taught and emphasized the importance of stretching and of play for learning. During this trip, we saw that Charissa had a pressure sore on her bottom and instructed her caregivers how to heal the wound. We were there for Wes’ birthday and were so happy to celebrate it with him and his new friends—complete with a birthday cake in Wes’ honor! We are thankful we had this opportunity to celebrate Wes. Sadly, he passed away March 7, 2019. 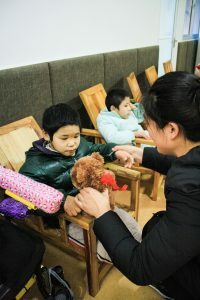 On our second trip to Shangrao, we were pleased to see that Charissa’s wound had healed but saddened to learn that her power wheelchair was broken. In order to prevent pressure sores in the future, she was going to need a power wheelchair that would allow her to relieve pressure by tilting in space. The chair also needed to fully recline to allow her to be changed without transferring her to a bed. While we were on-site, we continued to train the ayis assigned to therapy on developmental assessment, stretching, and play therapy. The care-giving ayis stated that they saw a big difference in the children after they had engaged in play. Leonard was working one-on-one with a therapy ayi and continued to make progress with his device. Beth continues to exhibit regurgitation of food and the doctors are still unsure of the cause. We have urged them to continue seeking answers. As you may have read in the February issue of Heartbeat, upon returning from our second visit to Shangrao, we started a campaign for Charissa’s new wheels and within 24 hours had received enough funding! We found just the right chair for her and got her settled into it during our third visit in January. As this is being written, one of our Chinese therapists is making a quick trip back to deliver a pressure-relieving cushion for Charissa’s chair and to ensure they are using the tilt-in-space feature every hour to prevent any more pressure sores. We also have two kiddos in a separate facility in Shangrao. You can see their information here.